I bet you can stunlock the megalodon. The little “*pat, pat*” is perfect. I’d pet Kade, too, if I’d chomped him down so rudely while he was only trying to hug me. Hey, did Tim draw your avatar? Doing God’s Work, he is, updating the wiki like that. “Cutlass” is spelled with two Ss. Nah, it didn’t work only because the Kraken isn’t a lass. Try getting Gordon RAMsey on board – he’ll cut the Kraken down to size AND finish off with calamari salad to boot. Before or after the word balloons filled with censor images? Then once the colourful language starts the tentacles return the verbal abuse in kind as physical abuse …. Gordon would not be pleased at all. Nicole looks awesome with a gun! Also, Tim, I sent you another email. How did I comment that twice? What happened? Ah reckon yer jus’ that good at it! 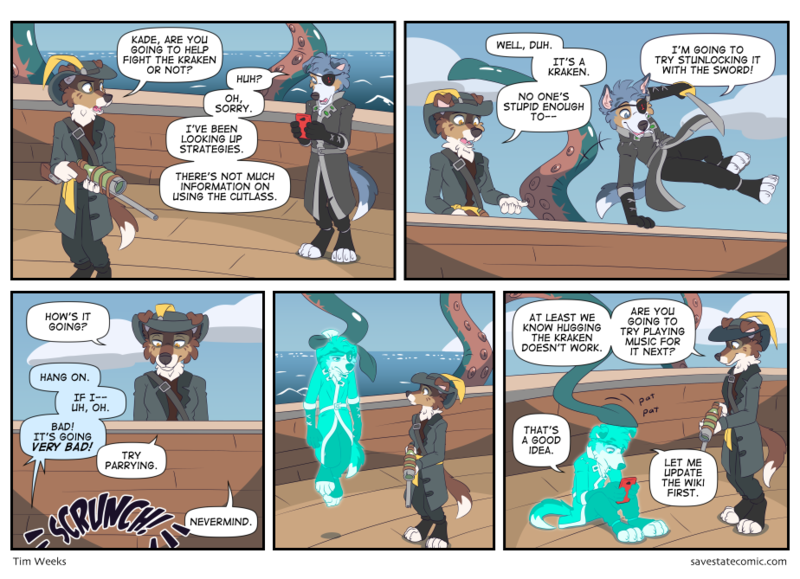 I like how the Kraken just seems to pity Kade or something. You can’t even interrupt the Megalodon’s attacks with a cannon shot. Yeah; but, -after- it kills you. Wait did Kade HUG the Kraken? Aww, that’s actually really cute! Love the kraken *pat pat*. Almost can see it saying, “You did your best. Maybe you will do better next time.” Polite monsters are the best. Gentle giants are so misunderstood. Sure, they tear you to pieces and eat you limb by limb, but they say sorry afterwards. I’m following several web-comics and i get such treatment only here : what’s wrong with this host ? I think it’s a problem with Akismet, and it’s quite common. A comment of mine just now was eaten by Nessy… I mean Akismet, where I posted a link to an article that criticizes the service heavily. Not surprised why it was eaten. At least we dont need to use facebook like a certain other webcomic artist. Hey, Kade! You left your Oldsmobile… I mean “cutlass” behind! At least the Kraken didn’t return in his behind – ouch. Last panel: Kade’s going to die again, isn’t he? Love Nicole’s little smile in panels three and five. Take on Cthulhu with a toothpick!